Views over Elton and the Peak District beyond. 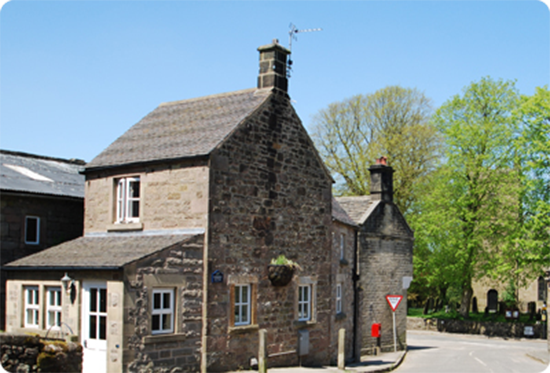 At Elton Holidays we offer our holiday makers lovely accommodation by staying at either our 4 star Bed and Breakfast or our two self catering, 4 star holiday cottages in the award winning conservation village of Elton, twice winner of the best Derbyshire small village competition. If you like noise, crowds, and problems parking etc , then don’t come to Elton. If it’s peace and quiet, open countryside, the Limestone Way, the White Peak Trail and other popular walks on your doorstep, then Elton is the ideal place for you. Bring your own cycles or motorbikes as we have our own large car park and a lock-up cycle/motor cycle store. Alternatively cycles can be hired on the nearby Monsal , Tissington and High Peak Trails. The walking in the area is outstanding, with easy reach to so many walks and there are also many excellent places to go for a meal close by. are situated 6 miles equi-distant between Matlock and Bakewell. 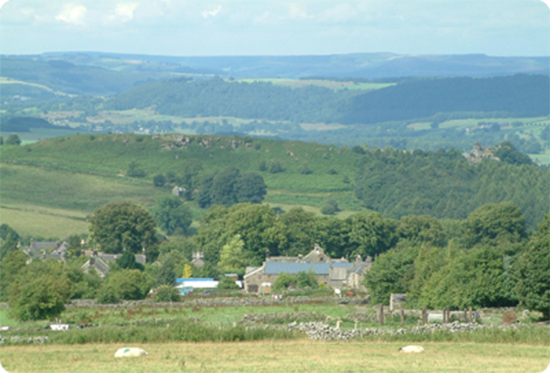 All the major attractions of the Peak District – Haddon Hall, Chatsworth, Buxton and Ashbourne are within easy reach. There are many villages and Market Towns nearby, including Wirksworth, Cromford, Bonsal, Ashbourne, Buxton, Longnor, Dovedale and Castleton, to name a few. Elton Holidays is an excellent place to bring your motorbike or bicycle as there is a secure place to store it, with plenty of parking spaces too. Self catering holidays in the Peak District with your motorbike or bicycle. Cottage holidays in the Peak District with your motorbike or bicycle and bed and breakfast holidays with your motorbike or bicycle. It really is a great base, right in the heart of the Peak District National Park. There is clearly lots of great walking in the area. 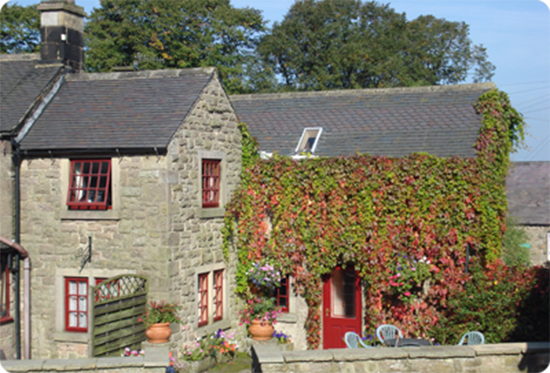 Elton Holidays is the perfect place base for all the Peak District and Derbyshire has to offer. We have two guest rooms, a spacious en-suite double/twin or family of 3 and a very spacious family/multi purpose suite comprising of a large bed sitting room with double and twin beds, a twin bedroom and bathroom all in one self contained suite and sensibly priced at only £90.00 per night. For a family for 2 adults and 2 children. This accommodation can sleep up to 6 people. Both bathrooms are a good size with bath and electric shower (not a cupboard in the corner of your room!) We also use our cottages when possible for Bed and Breakfast and can accommodate up to 14 people. Two Gates cottage is the old bothy of this former farm situated in the courtyard behind the main guest house. This cottage sleeps four people. Two bedrooms, one double and one twin room. Fully equipped kitchen and bathroom, beautifully decorated and furnished throughout. This cottage is a treat with beautiful furniture and spacious surroundings. The cottage has a patio and garden furniture. Cots and high chairs are available if required. Linen, towels and utilities are all inclusive. Short breaks will be accommodated for subject to availability. Prices are inexpensive ranging from £225 – to £395 per week depending on the time of year. Please give us a call to discuss your requirements. Pepperpot cottage is a quaint 19th centrury cottage, situated in the lovely Village of Elton, it is an ideal cottage for 2 people. It has a beautifully decorated living room, fully equipped kitchen and bathroom, a spiral staircase and one double bedroom all equipped beautifully throughout. The cottage has a patio and garden furniture . Cots and high chairs are available if required. Linen, towels and utilities are all inclusive. Short breaks will be accommodated for subject to availability. Prices are inexpensive ranging from just £195 – to £335 per week, depending on the time of year. Please give us a call to discuss your requirements. We have two guest rooms, a spacious en-suite double and a very spacious family/multi purpose suite comprising of a large bed sitting room with double and twin beds, a twin bedroom and bathroom all in one self contained suite and sensibly priced at only £80.00 – £85.00 per night. For a family for 2 adults and 2 children. This accommodation can sleep up to 6 people. Both bathrooms are a good size with bath and electric shower (not a cupboard in the corner of your room!) We also use our cottages when possible for Bed and Breakfast and can accommodate up to 14 people. 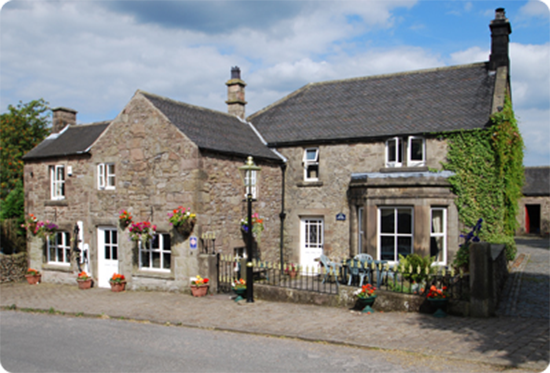 Two Gates cottage is the old bothy of this former farm situated in the courtyard behind the main guest house. This cottage sleeps four people. Two bedrooms, one double and one twin room. Fully equipped kitchen and bathroom, beautifully decorated and furnished throughout. This cottage is a treat with beautiful furniture and spacious surroundings. The cottage has a patio and garden furniture. Cots and high chairs are available if required. Pepperpot cottage is a quaint 19th centrury cottage, situated in the lovely Village of Elton, it is an ideal cottage for 2 people. It has a beautifully decorated living room, fully equipped kitchen and bathroom, a spiral staircase and one double bedroom all equipped beautifully throughout.